This article is about the phrase. For the anatomical part, see Achilles tendon. For other uses, see Achilles Heel (disambiguation). Statue of Achilleas Thniskon (Dying Achilles) at the Corfu Achilleion. An Achilles’ heel or Achilles heel is a weakness in spite of overall strength, which can lead to downfall. While the mythological origin refers to a physical vulnerability, idiomatic references to other attributes or qualities that can lead to downfall are common. 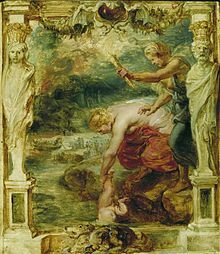 Oil painting (c. 1625) by Peter Paul Rubens of the goddess Thetis dipping her son Achilles in the River Styx, which runs through Hades. In the background, the ferryman Charon rows the dead across the river in his boat. Classical myths attribute Achilles’s invulnerability to his mother Thetis having treated him with ambrosia and burned away his mortality in the hearth fire except on the heel, by which she held him. Peleus, his father, discovered the treatment and was alarmed to see Thetis holding the baby in the flames, which offended her and made her leave the treatment incomplete. According to a myth arising later, his mother had dipped the infant Achilles in the river Styx, holding onto him by his heel, and he became invulnerable where the waters touched him—that is, everywhere except the areas of his heel that were covered by her thumb and forefinger. The large and prominent tendon of the gastrocnemius,soleus, and plantaris muscles of the calf is called the tendo achilleus or Achilles tendon. This is commonly associated with the site of Achilles’ death wound. Tendons are avascular, so such an injury is unlikely to be fatal; however, the myth has the arrow poisoned with the blood of the Lernaean Hydra. A more likely anatomical basis for Achilles’s death, assuming an unpoisoned dart, would have been an injury to his posterior tibial artery behind the medial malleolus, in between the tendons of the flexor digitorum longus and the posterior tibial vein. This area could also have been included in Thetis’s grip. Look up Achilles heel in Wiktionary, the free dictionary. ^ See P. J. Heslin, The Transvestite Achilles: Gender and Genre in Statius’ Achilleid, Cambridge: Cambridge University Press: 2005, 166–169.